Wurst is history: Look at all those happy little sausages dangling down the mitten! If you're hungry for your own pair, watch for the pattern's release the week of Sunday, 25 January 2009. Of course, there's another pattern in the works, and this one is coming out this week: Yes, it's Bavarois (which hasn't been officially added to the Ravelry pattern library yet,) which might be my most-photographed pair of mittens ever. I just can't get enough of that colour! Here they are next to my current favourite beverage (Perrier with lime) served in my current favourite glass (from Ikea's Busig series) sitting on one of Heather's quilted coasters (I told you I used them, lady!) 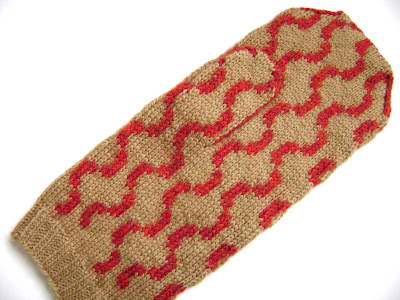 I can not wait to get this pattern out there -- I am still in love with these mittens! 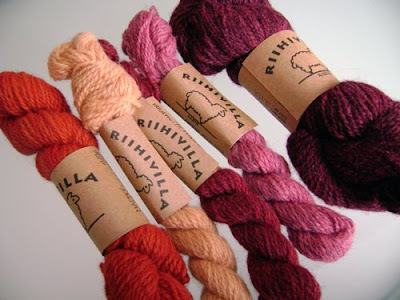 All Bavarois aside, I don't think I could have picked a better day to finish off Wurst because look what arrived here today: It's Riihivilla's Aarni Bloom Selection -- a sort-of mitten kit meant to be combined with the Bloom Mittens. Of course, a big selling point of the yarn (for me) is that the purpley reds you see above have been dyed with cochineal. I've been mad for cochineal ever since I read Colour by Victoria Finlay, so you can imagine how excited I am to have the chance to work with this yarn. I can see this stuff becoming a...habit. 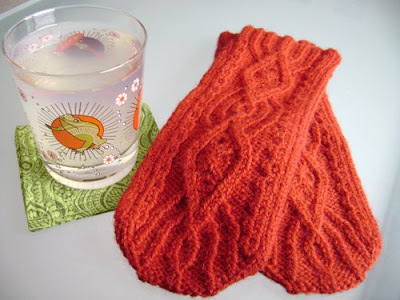 The mittens and the yarn look fantastic! I can't wait to see what you come up with. January 19, 2009 at 10:25 p.m.
Man, I have got to make some more of those coasters! Love your Wurst; a real sausage fest! January 19, 2009 at 10:45 p.m. I love the way the little sausages continue right up the thumbs. I'm having almost as much fun watching your mittens appear, as you are knitting them! January 22, 2009 at 5:49 p.m.